It’s been ten years this past spring since I first laid my hands on a 35mm SLR camera and began my journey into nature photography. The camera was a birthday gift from my parents, a hand-me-down Minolta 7000i with an inexpensive 35-80mm lens. I felt like a pro with this gear and knew it would only be a short time before National Geographic would call and offer to send me to Madagascar or Patagonia to photograph something that no human had ever seen before. With my camera in fully-automatic mode (since I knew nothing at all about photography), I would capture magazine cover shots with ease. Or so I thought! Before giving National Geo the chance to dial my number, I headed out to nearby Point Pelee National Park - the place that inspired my love of nature and birds. It was there with my incredible zoom lens set at 80mm that I took my first-ever photo of a bird: a Common Yellowthroat warbler on a cattail in the marsh. Anxiety nearly killed me as I raced to the grocery store to develop that roll of print film. So you can imagine my surprise when upon close (actually, very close) examination, the yellowthroat was but a speck in the frame. An electron microscope would be required to pick out field marks. I was humbled! Well for whatever strange reason, it’s now 10 years and 250,000 or so photos later and I’m still at it. It’s been a remarkable personal journey full of awesome discoveries, huge personal rewards and staggering disappointments - sometimes all in the same day! And I have to credit my camera and nature photography for getting me through a rough period of life when my young sister Karla was killed. Karla's death was a wake up call for me to live each day richly, chasing my dreams with relentless determination. It made me realize that the only limits to my personal growth were self-imposed. These were monumental lessons for an aspiring young nature photographer. Although I’ve learned a hell of a lot about nature photography along the way (mostly through costly mistakes), if I had to distill it all down to one key piece of advice, call it ‘the secret to nature photography’ it would be this: BE THERE! It’s worth repeating: BE THERE! The simple fact is that the more time you spend out in nature with your camera, the better you’re going to get at photography and the better your photos will be. Be out at the right times of day, even if it means hiking in the dark. Visit places repeatedly so you know exactly when the light is best. Spend hours observing the behaviour of species so you’re able to predict (and capture) spectacular moments of action. I think Wayne Gretzky says it best, "You miss 100% of the shots you don’t take!" The rewards are within reach for all of us, if we just get out and BE THERE! 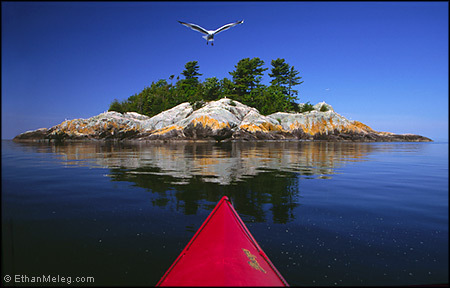 My kayak, a small island and a Herring Gull aligned in Lake Superior. Sometimes when you're in the right place, at the right time, it all just comes together! Technicals: EOS 1N, 20-35mm f3.5-4.5 @ 24mm; polarizer, Fuji Velvia +1 stop, handheld; exposure unrecorded.